Welcome to The Old Cannon Brewery, Bar, Brasserie and Bed & Breakfast, located in the heart of Bury St Edmunds. We are proud to be a privately owned, genuinely independent free house in Bury and certainly the only brew pub in Suffolk where you can actually see beer in the making on a regular basis. Beers are made on the premises using East Anglian grown and malted barley, choice hops and the special house yeast. Former runners-up in the Suffolk Food & Drink Awards for Best Food Pub, our Brewery Kitchen serves fresh and seasonal produce purchased from known local producers - our style is British traditional/regional with a twist. The 'eat' page on our website has much more information and sample menus, so click through to our webiste (see Visit Website link above) now and take a look. The Brewery Rooms are situated in the old brewhouse which was sensitively converted to provided comfortable accommodation. There are six double rooms and one twin all offering guests large en-suite shower rooms. 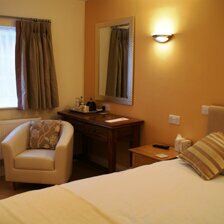 Each room has wireless internet coverage, digital television and tea & coffee making facilities. We are able to offer overnight guests secure, off-street parking in the Brewery Yard. We pride ourselves on sourcing our delicious fresh breakfast produce from within Suffolk. We're situated in a quiet residential area of Bury, just a short walk from the centre, and as convenient as any hotel in Bury St Edmunds with our guests able to make use of the Brewery Bar and Brasserie just across the yard. Bury St Edmunds, with its surrounding countryside and villages, is a lovely place to visit at any time of the year. The recently restored Regency Theatre Royal, old Abbey Gardens and the new Millennium Tower on Bury's beautiful cathedral are some of the many highlights in this delightful and historic market town, plus we're a stone's throw from the lovely boutiques in St John's Street and the new shops in the town's old cattle market. Find out more about Bury St Edmunds and what's on by clicking the links below. 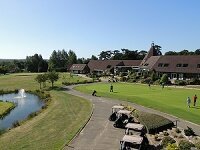 Rates for a double room including full English breakfast, and VAT for two are £90 (£70 for single occupancy). So now you know what you can give the man in your life who has everything? An overnight stay in a brewery is the answer! For prices, availability and online booking just click through to our website or call us now.